Samsung Electronics will provide its ultra-high definition technology as an open source for various industry players by the end of the year, hoping the tech to be used not only for premium televisions, but also online video content players and gaming, the company said Monday. 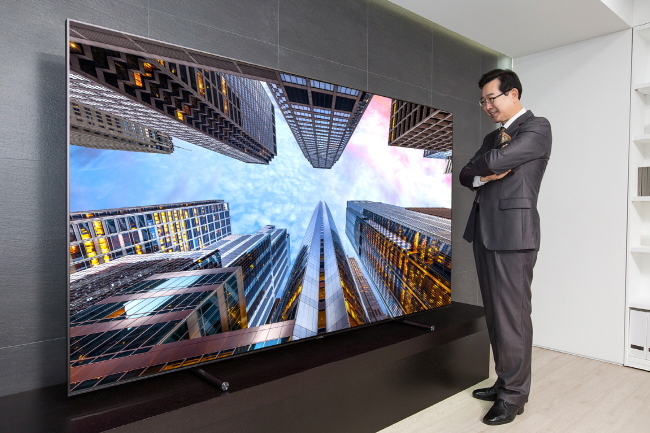 The South Korean tech titan has solely developed the High Dynamic Range 10 Plus tech and applied to all lineups of quantum-dot light emitting diode TVs and ultra-high definition TVs launched this year. Known as the HDR 10+, the tech enables representation of images with more than 10 different levels of contrast range in a single scene, increasing depth of dark colors. It has evolved from the predecessor HDR 10 that was introduced in 2010 and certified by the global UHD Alliance. Based on a signed partnership with Samsung in April, Amazon will start providing a new video streaming service based on the HDR 10+ through its Amazon Prime Video application this year. “We will also announce a new partnership with new content providers at the upcoming event (IFA Berlin) next month,” said an executive of the visual display division at Samsung. Samsung plans to promote the tech by installing HDR 10+ screens at the largest trade show for home appliances in Europe, scheduled to be held from Sept.1 to 6. “Although it is our proprietary technology, we decided to provide it as an open source with an aim to lead competition for standardization of TV technologies,” the executive said. Samsung is currently contending with Dolby Vision on standardization of HDR specifications. It intends to spread the use of the company’s HDR 10+ from visual devices further to mobile devices, possibly including the upcoming Samsung premium Galaxy Note 8, according to the official.